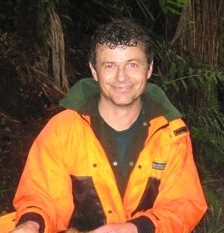 Today we profile Greg Van Der Lee, DOC Ranger in Hauraki. The work is so diverse. One minute I’m sending out emails to iwi for consultation on a wildlife permit and the next minute the phone rings, and I’m talking to someone in Dunedin about easements for a cycle way. I might be trying to write a request for proposal for land acquisition, and then my mate from down the hall asks for a map of historic land surveys in relation to a new hut. I have had some victories! The recent funding round from the New Zealand Recreation Consortium saw all four of my community applicants receive grants. The work that these community groups are doing is amazing. If you want to get something done, give the job to passionate people. Then support them. DOC’s vision is huge. Engaging more people in some capacity is crucial to give ourselves some space to breathe. How we engage and manage the community enthusiasm is the trick. People want to help; we need to make it easier for them to get on with it. I love that I can make a difference. I like making connections between corporations and community groups. I love giving support and encouragement to small groups and seeing the successful outcomes. 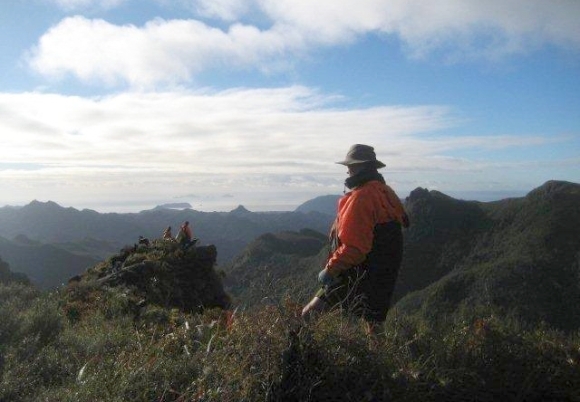 I started in DOC as a goat hunter—hunting the western flank of the Coromandel Range in a team of four hunters. The terrain is fairly challenging, with some reasonably steep bits—just the sort of place goats flourish. 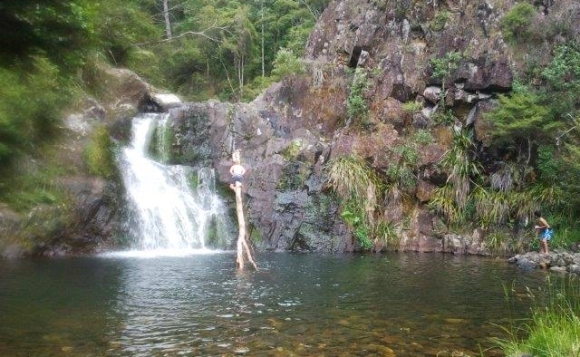 We were in the Opitonui catchment, not far from Castle Rock. I was onto a small mob and my dog was bailing nicely about 3 metres below me. I was standing on a small grassy knob and, as I tried to look over to get a shot, the whole lump of grass gave way. I remember the tumble drier effect of the fall, and the wet nose of my faithful companion in my face after I landed. I had the classic “my life flashed past my eyes!” moment, and wondered if “this it”. I lay there for a few moments—no pain—got up, cleared the barrel, looked back up the bluff and the goats were gone! Not a method I recommend to get bluffed goats. There are actually two people that I need to mention here; Fin Buchanan and Gemma White. Fin was the Programme Manager that hired me. I think the work he and Carol Nanning are doing with their dogs is amazing. 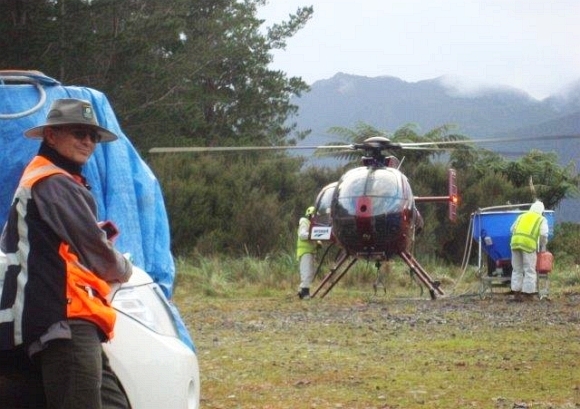 Fin has always been ready to go the extra distance required to make advances for conservation. He puts a whole of life commitment to the cause. Even his time off is often spent up in the bush (ask him where he was last week). Gemma White is probably the best boss I’ve ever had (next to my wife of course). I don’t know how she does all that comes across her desk. If it was only the stuff at the office that got her attention, that would be enough, but weekends are not sacred, and then home life is interrupted by meetings out of district. The effort she puts in is amazing, and it’s not all pure grunt. Her eye for detail is always catching me out. She demands a high standard, but has the patience to spend time with me to get across what she wants. I have learnt so much working with Gemma. I am Canadian. I immigrated to New Zealand in 1972 with the whole family. I grew up in South Auckland and fell in love with this country, and have only been back to Canada once. My song of the season is, ‘Mary, did you know?’ by the Pentatonix. This song captures what Christmas means to me and this version has great harmonies. My farm! 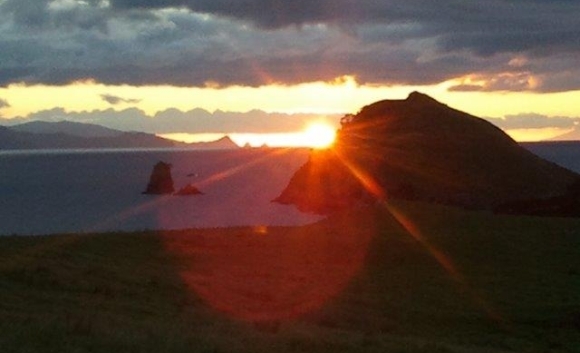 I live at Omahu Valley, right at the end of the formed road. 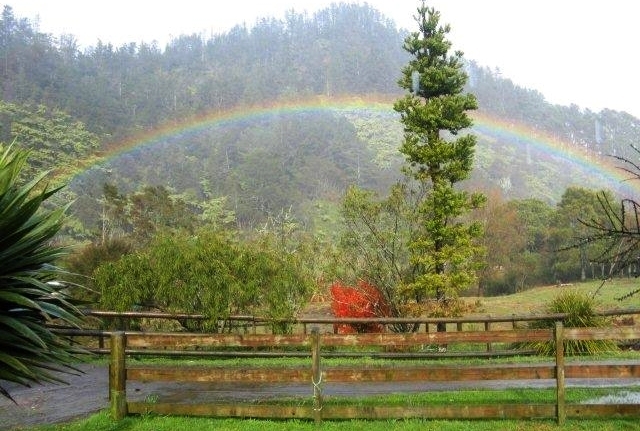 I look out my dining room window at the Coromandel Forest Park rising above us into the clouds. I love the mist hanging in the trees and cloaking the hills. I always wanted to be an explorer. Maybe Kupe or Captain James T Kirk. Three months in Queensland, Australia, when I was young and foolish. I bowled a hat-trick for the ‘Get drunk on Sunday’ cricket team. I don’t know if it’s a quote, but I love to say “I told you so.” I don’t get to say it very often! My dad said, “You don’t have to do very much more than everyone one else to really standout”. Get off the couch, go outside and do something physical. If you were given the ability to compete in any Olympic event, what would you choose and why? One of the shooting disciplines. I’m a pretty crack shot, and the high level training would suit me just fine. Shooting at that level is a very self aware and physically technical skill. I love the self discipline required to have your body completely relaxed, breathing and heartbeat synchronised, and timing the release. Once you get into that zone the rest of the world just disappears. It’s all about that tiny speck that is the very centre of the target.